Hello, and welcome to the “Shakespeare and His Critics” website. This site contains a mixture of historical and modern documents related to Shakespeare and Renaissance drama. … was written by the acclaimed 19th Century actress, Helena Faucit (Lady Martin by marriage). Helena Faucit acted with Macready at Covent Garden and Drury Lane, and toured with him internationally. Her letter on Ophelia offers a perceptive and lively interpretation of Ophelia’s role within the play – but her digressions provide just as much interest. We get a glimpse of her childhood, a chance to lurk backstage during one of Macready’s international tours, and can watch a Victorian actress developing her character for performance. … published in her book “Shakspeare’s Heroines”; originally known as “Characteristics of Women, Moral, Poetical and Historical” (1832). This was the very first book-length examination of Shakespeare’s female characters, and can be said to have been the origin of all subsequent study of Shakespeare’s women as a topic in themselves. … written by an acclaimed Victorian Shakespearean. This fictionalised account of Ophelia’s childhood is a good example of the sort of character-based study that was popular in the Victorian period. This common Victorian portrayal of Ophelia regarded her as an innocent, who had certainly not had a sexual relationship with Hamlet, and who had learned the bawdy songs that she sings in her mad scene from her childhood stay with a vulgar peasant family who looked after her during her noble parents absence. … A working draft of an Ophelia Bibliography (produced by me, Thomas Larque) listing books, articles, essays, dissertations, plays, novels and poems centred on the character of Ophelia from Shakespeare’s Hamlet. Additions, corrections and suggestions are welcome. If you have published, read, or seen anything performed about Ophelia that is not included in the Bibliography then please let me know. … (first published in Characters of Shakespear’s Plays in 1817). Brimming with enthusiasm, Hazlitt’s essay has been hugely influential and is still as thought-provoking and informative today. … delivered in 1818 and collected by Thomas Ashe. Coleridge was a great poet himself and his criticism of Shakespeare has long been admired. He has been called the finest critic of the romantic period and the father of much 20th Century criticism. … very short notes on Hamlet, Polonius and Hamlet with Ophelia. Taken as extracts from Coleridge’s “Table Talk”. … edited by Sir Walter Raleigh. Johnson is famous as the creator of the first complete English Dictionary. He was also a significant editor of Shakespeare’s plays, and his notes on the plays are highly regarded. His judgements sometimes seem odd to modern readers – he so hated the unhappy ending of King Lear, for example, that he refused to read it again until he was forced to – but he makes some satisfying points. … taken from the 8th February 1879 edition of Charles Dickens’s journal “All The Year Round”. This is mainly a discussion of The Hystorie of Hamblet, an anonymous English novel based on Belleforest and Saxo Grammaticus, which may have been used as a source for Shakespeare’s Hamlet . At the end of the essay, however, are some comments on the costuming and production style of some 19th Century Hamlets. … published in two parts in January and February 1880 editions of “The Theatre” magazine. This essay discusses the various German Shylocks of the 18th and 19th Centuries, but also includes an interesting digression into the difference between the German and British interest in Shakespeare in the 1880s. Despite being determinedly patriotic, the English author is forced to admit that Shakespeare is less popular and less frequently produced in his home country than he is in “the Fatherland”, and that German critics publish a larger body of criticism on Shakespeare than do their British equivalents. Nevertheless, he argues that the quality of the English language criticism is suitably superior. … first published in 1788. The first ever detailed examination of Shakespeare’s female characters to be published. Richardson attempts to defend Shakespeare from accusations that his female characters are too similar to each other, and less interesting and less well portrayed than his men. Richardson argues that Shakespeare is justified in producing less varied female characters, since real women show less diversity of character and occupation than men. In trying to show the artistic value of Shakespeare’s women, he concentrates upon the “propriety” and “discrimination” of their characters, arguing that they show proper female reserve and delicacy. The disdain for Shakespeare’s female characters to which Richardson was responding is probably at least partly explained by the change in attitudes that accompanied the introduction of female actors in the mid-seventeenth century. Shakespeare’s plays were considered old fashioned, since their female parts were written for boys playing supporting roles, while the more modern playwrights wrote specifically for female actors and audiences with more interest in leading female parts. Richardson particularly discusses Miranda, Isabella, Beatrice, Portia, and Cordelia. … delivered to the Arts Club, Manchester in 1893. This intriguing and enjoyable lecture details the “Revivalist” productions of the Victorian period – by Kean, Phelps, Calvert and Irving. These productions were characterised by a huge expense of money and time, culminating in Calvert and Irving’s detailed research into their productions. Calvert’s Merchant of Venice , for example, warranted a research trip to Italy and the purchase of an authentic gondola, while research for his Henry V settled some previously unsolved questions about the heraldry of the battle. Darbyshire describes some aspects of these productions, and their preparation, in loving detail and gives a real insight into the spectacular scale and logistics of the “Revivalist” productions, with their casts of hundreds. Darbyshire was an Architect, and amateur actor, and designed a significant number of theatres – working closely with Henry Irving. … Samuel Daniel’s sonnets and narrative poem (published in 1592) had a strong influence upon Shakespeare’s writing, especially his Sonnets. [External link – My old-spelling transcription of Daniel’s poetry is on the Renascence Editions Website]. … An introductory lecture and overview on Elizabethan Theatre that I gave (as a specialist guest lecturer) for BTEC in Performing Arts students in 2001. The lecture deals with the following topics: Drama before theatres, the first Theatre, the Globe, the players, the playwrights, politics and religion, costume, scenery and effects, performance techniques, and further reading. … A Directory of British Doctoral and Research Masters theses on Shakespearean subjects from 1990-2006, by me, Thomas Larque. 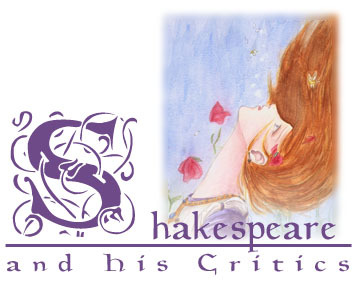 Published on the British Shakespeare Association website. Includes a statistical summary of the number of Shakespearean Doctoral theses produced each year in this period, and the number of Shakespearean Doctoral theses produced by each University. … A Directory of Masters Degrees offered by British Universities with a Shakespearean or Early Modern subject or named pathway. Lists Masters degrees in Shakespeare, Early Modern History, Early Modern Literature, and Interdisciplinary Early Modern Studies. … An actor’s description of his performance reading of the role of Toby Belch in a production by Spotlites Theatre Company, written by me, Thomas Larque. Please note that I wasn’t very old when I played this role, nor even when I wrote this description of it.